The BAH offers independent suspension of each broom end which provides longer broom bristle life and reduces the broom “coning effect” relative to the surface being swept. TYMCO’s simple design approach allows for BAH broom replacement in 30 minutes or less and without the need to remove the pick-up head. The Model 500x pick-up head also comes standard with long-lasting Duo-Skids® which provide increased sweeping performance and longer wear. Has a 10,000 lb lift capacity. All pivots on the lift are self-lubricating and never require greasing. Integral counterbalance holding valves ensure controlled lowering of the lift assembly and serve as redundant safety locks. Dual stabilizers automatically deploy before the dump cycle begins assuring unit stability throughout the dumping procedure. The 500x is also integrated with the truck chassis transmission, only allowing dumping when the truck is in neutral with the parking break set. An optional tilt adjuster allows you to reach down into the deepest curbs or gutters typically found throughout city industrial and residential streets. The innovative gutter broom provides excellent performance by automatically determining the “digging” pressure needed for different debris; therefore, owners get maximum gutter broom bristle life and sweeping performance. If the gutter broom encounters an immovable object, it will automatically retract to avoid potential damage and return to the original position once the immovable object has been passed, all without intervention from the operator. The Model 500x is the only street sweeper on the market with a high-efficiency centrifugal dust separator for maximum fine dust particulate separation which provides excellent dust control while using less water. TYMCO’s engineers take several aspects into account when designing for better dust control such as water nozzle design and placement, not just adding more water like other street sweepers. For example, if the operator has not engaged the blower, but the dust control system is on, the 500x “pauses” the dust control system until the operator engages the blower; therefore saving gallons of water that could have been wasted when the operator wasn’t sweeping. The Model 500x has a water capacity of 250 gallons which provides hours of sweeping while maintaining excellent dust control. 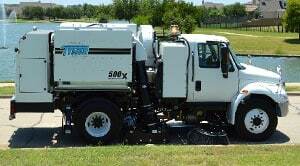 The Model 500x is the only high dump street sweeper that utilizes a super-efficient aluminum alloy blower that is self-cleaning and reduces fuel consumption because of its lightweight design requiring less horsepower. The blower is designed to work with the TYMCO Regenerative Air System to both push and pull air which delivers even greater sweeping performance. The Model 500x blower has a natural rubber coating that provides maximum wear against abrasive debris.